Platforming games are almost as old as video gaming itself, but technically jumping games might be a more accurate term for most of them, since you don’t actually interact with the platform. Semblance on the other hand sees itself as the first true platforming game, because it gives players the ability to create and manipulate the world and platforms around them. Semblance controls like a lot of other platformers. One stick moves the player, one button jumps, and another performs a dash. However, that dash holds the key to completing puzzles. 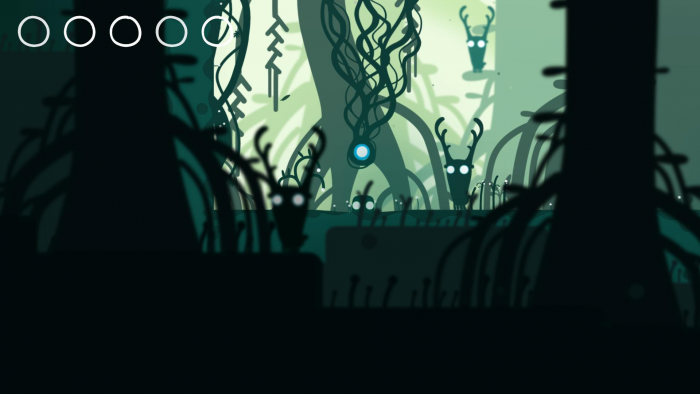 The dash can be used to manipulate parts of the environment, allowing players to create paths or block obstacles in an effort to reach the desired goal. It’s a unique mechanic that will force players to rethink how they view platforming puzzles. Creating your own ways through levels feels great, and it will definitely be interesting to see if players are able to come up with multiple ways of solving the same problem. Although I only got hands on time with a few levels, the game itself won’t prevent players from jumping right into its hardest levels if they feel ready. Any level of the game is accessible from the start, it’s up to the player to figure out what they have to do to reach these harder challenges. Ways to solve these harder challenges will be slowly taught to the player in earlier levels, allowing them to develop the ability to read these puzzles easier. But if a player figures out some of that hard stuff by themselves developer Nyamakop doesn’t see a need to hold them back if they want to go on. Semblance will be releasing on Nintendo Switch and PC by the end of 2018. Sam Dixon is a Contributing Editor at SideQuesting. He's a king of Indies, and also a very snappy dresser.